In a booming housing market like Dallas-Fort Worth, it's not easy to stand out. But these projects and execs have found a way to do just that. How long can the good times roll? Those involved in the North Texas housing market have yet to find out, as demand continues to burn. Some industry experts predicted a slowdown in 2016, but that hasn’t happened. North Texas saw record home sales and record pricing in June. According to the MetroTexas Association of Realtors, sales increased 7 percent (annually) to 10,857 sales, with the median price growing by 8 percent. Completed sales topped $3.1 billion for the month, a 13 percent increase over last year. Supply is the biggest challenge, and the rains earlier this year did nothing to help that. Homebuilders also are challenged by rising land and construction costs and labor shortages. Despite the pressures involved in getting new projects off the ground, many DFW single-family and multifamily developers are doing exceptional work. D CEO is pleased to honor some of the best with its second annual Residential Real Estate Awards. Profiles of the winners appear on the following pages. When Shawn Todd acquired the 30-story office building now known as One Dallas Center out of foreclosure in 2012, he saw the struggling property as an “empty canvas.” That was just one of the things that attracted him to the “big elephant,” he says. And just how do you eat an elephant? “One bite at a time,” Todd says. The CEO and founder of Todd Interests focuses on both value-add opportunities and mainstream real estate investments in Dallas. One Dallas Center had good bones and a desirable location at North St. Paul and Bryan streets in downtown Dallas. It also had a DART station at its base, where the light-rail system’s red, orange, green, and blue lines converge. On top of that, the 1970s building was designed by noted architecture firm I.M. Pei & Partners. Todd secured big headquarters leases from HKS Inc. and Greyhound Lines to fill up the bottom half of the building, then redeveloped the top half into luxury apartments, bringing in Dallas-based StreetLights Residential to head up the effort. The partners helped kick off an unprecedented redevelopment wave in downtown Dallas, where languishing buildings are being repurposed into much-needed residences. “We really feel like we had the chance to contribute something unique and different to the city,” Todd says. —O.N. Robert Shaw likes to operate under the radar, preferring to let his work speak for itself. The new urbanism pioneer was incorporating walkability into his projects back in the 1980s, well before anyone had heard of “live-work-play.” With nearly 3,000 apartment units in various stages of construction, it’s becoming more of a challenge to keep a low profile. 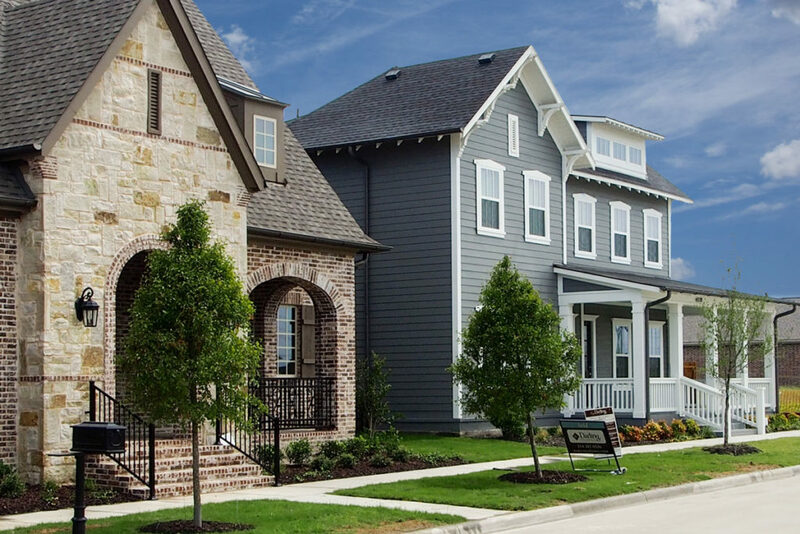 Shaw is behind some of the most exciting projects in North Texas, including Cypress at Trinity Groves in Dallas, The District at Craig Ranch in McKinney, and The Grand at Legacy West in Plano. The location and surrounding area of the developments make each one unique, he says. Shaw says the most exciting trend in multifamily is the proliferation of high-rise projects in North Texas—both the number of developments and the drama of seeing whether the demand will be there to support it. After decades in the business, the former Dallas Cowboys player still finds his real estate career very rewarding. “When you have a great lease-up of a new project, it validates all the work that has gone into the project,” he says. —C.P. Among other things, the late, legendary developer Trammell Crow created the Design District in Dallas. Although the Crow family sold the bulk of its assets in the district in the mid-2000s, it still owns the first warehouse Crow built there. Steve Bancroft oversaw the portfolio’s disposition and, prior to that, was instrumental in the formation of a tax increment financing district for the Design District as a longtime executive with Crow Holdings. In 2011, he shifted to affiliate Trammell Crow Residential, where he serves as senior vice president of development. One of his latest projects takes him back to the Design District. The five-story, 309-unit Alexan Riveredge sits near the Trinity River, between the Trinity Strand Trail and the Trinity Skyline and Levee Trails. 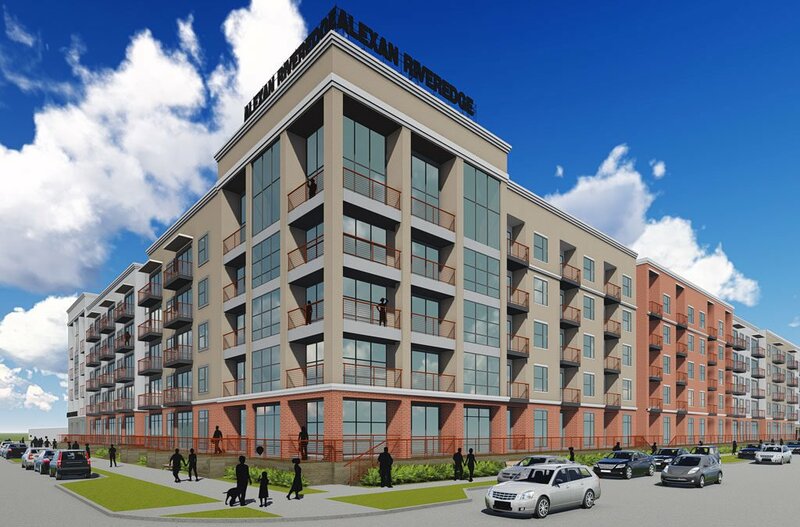 The project was named a “catalyst development” by the city of Dallas and is the first high-density residential development to be built on the west side of Irving Boulevard. The project was awarded $7.8 million in TIF funds, which TCR will use, in part, to make improvements along Turtle Creek Boulevard and create connections between the trails. “This would not have worked, economically, without the public-private partnership with the city of Dallas,” Bancroft says. The busy developer has 17 deals in the works. “Ten are under construction, and we have five pursuits that we expect to close in the first quarter of next year,” he says. —C.P. When the Dallas housing market began to tank in 2008, Robert Elliott swooped in and acquired more than 50 single-family lots in the highly sought-after Highland Park and University Park communities. 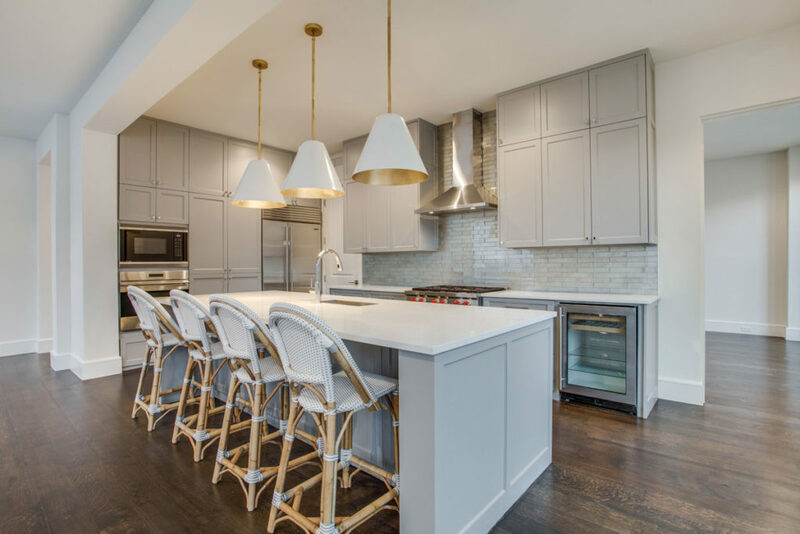 Since then, his Robert Elliott Custom Homes has been making the most of those and subsequent investments, with 20 to 25 projects in different stages of development each year. Meantime, his partner at affiliate Stillwater Capital, Aaron Sherman, a former Hillwood executive, has been active on the multifamily front. (Former St. Louis Rams player Rich Coady rounds out the three-man ownership team.) The partners’ specialties align with projects like The Mondara, an upscale condominium property on Abbott Avenue in Highland Park. Close to both the Katy Trail and retail and restaurant amenities on Knox Street, The Mondara targets Park Cities empty-nesters looking to downsize. Of The Mondara’s 39 units, 23 have already been sold, with units ranging from 1,800 square feet to 3,400 square feet and prices from $800,000 to $2.1 million. 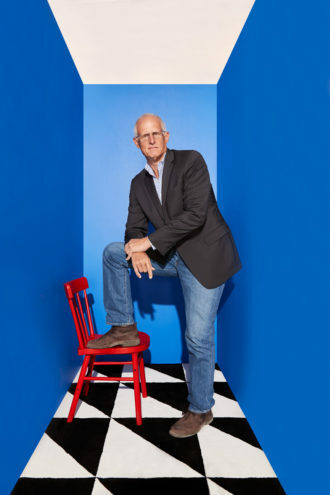 “We’re unique because we have a multifamily mindset yet we come at it from the perspective of a high-end, luxury custom home builder,” Elliott says. “We find we are a hybrid. We play in a space that not many people play in.” —C.P. John Hodge and his business partner Bill Gietema met in the mid-1980s as grad school students at the Massachusetts Institute of Technology. After graduating, Gietema went to New York and Hodge moved to Midland and worked in the oil and gas industry. They stayed in touch and, about five years later, decided to go into the real estate business together. Hodge got out a map and picked Dallas. 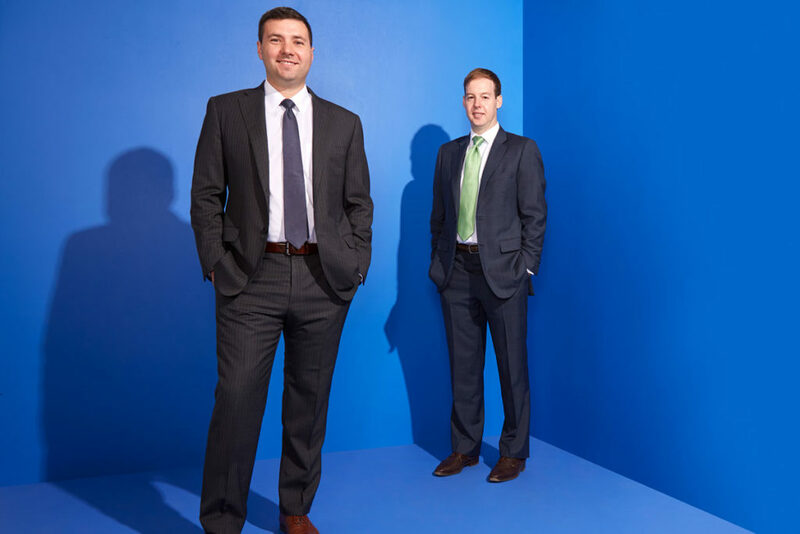 They formed Arcadia Realty Corp. and decided to focus on single-family residential, so they wouldn’t have to compete with legends like Trammell Crow. Arcadia has since developed more than 30 residential and mixed-use projects. The Canals at Grand Park in Frisco is one of their latest. The first phase included 260 single-family lots; the second phase will add another 125 homes. But The Canals also includes multifamily (by StreetLights Residential) and senior living space. “We like to think of The Canals as a one-stop, cradle-to-grave kind of place,” Hodge says. The development stands out for its canals, parks, walkability, and strict architectural guidelines. Hodge says sales have exceeded expectations. “We’re probably a year behind in delivering lots, because of all of the rain,” he says. “But we’re a year ahead take-down wise. So it all evened out.” —C.P. 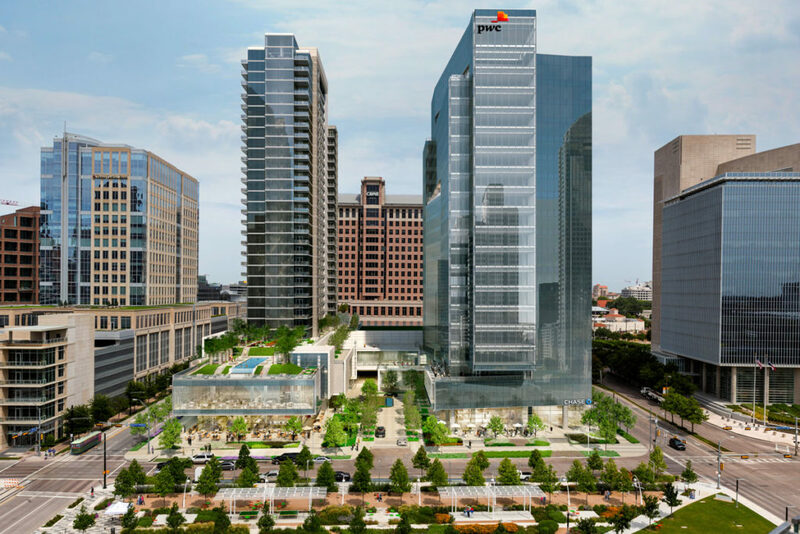 If Trammell Crow Co. had stuck to its original plans, Park District, its new development between Pearl and Olive streets along Klyde Warren Park, would not have a residential tower. The initial concept, based on entitlements, was strictly for office use. “It would have been wildly successful and probably would have delivered a year ago,” says Joel Behrens, principal at Trammell Crow Co. “But we took a step back and thought about what would be best for the site.” This isn’t just any site. Trammell Crow and its investment partner, MetLife, reportedly paid more than $300 per square foot for the high-profile block—a Dallas record. “We knew we’d only get one shot at this, and office-only seemed to be an under-utilization,” Behrens says. Construction is now underway on the 34-story, 228-unit residential tower, which is scheduled to open in the summer of 2018. It will sit next to a 20-story office building, anchored by a big lease from PwC. 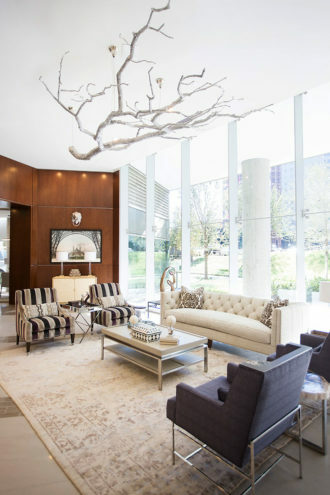 Perks include an “enormous” fitness center, which is shared with and connects to the office tower, valet and concierge services, and a multi-tiered amenity deck overlooking Klyde Warren Park and downtown Dallas. —C.P. Long before she passed away at the age of 104 last September, Ebby Halliday knew who she wanted to succeed her at the helm of the company she founded in 1945. After all, Mary Frances Burleson had been by her side for more than 50 years, and had been instrumental in growing Ebby Halliday Cos. into the largest residential real estate firm in Texas. As president and CEO, Burleson now oversees Ebby Halliday Realtors, Dave Perry-Miller Real Estate, and Williams Trew Real Estate. The operation ranks No. 10 nationally, with $7.85 billion in 2015 sales. Career options for women in the 1950s were limited, Burleson says. “I get sick if someone else is sick, so nursing was out,” she says. “And I get nervous flying, so being a flight attendant wasn’t an option either.” After getting married, Burleson gave up a college scholarship and signed on with a temp agency, taking on various assignments. One day in February 1958, she was sent to work for Ebby Halliday, replacing a secretary who had recently left. She was paid $2.50 an hour, working part time. The post quickly evolved into a permanent, full-time job. Burleson worked on Halliday’s correspondence and speeches and soaked up all of the lessons she shared. She also began taking classes at Southern Methodist University, slowly but surely racking up credits until she earned a degree. “I have a diploma from SMU, but I got a Ph.D. working for Ebby,” Burleson says. “I never knew what a glass ceiling was, because I worked for her.” In the mid-1960s, real estate license in hand, she persuaded Halliday to let her open an outpost in Richardson. She recruited, listed, and sold homes and even did appraisals. Within four years, she had opened offices in Plano and become a regional manager. Burleson was always “scheming and dreaming,” she says, and was hooked on the business. “Ebby called them sales transactions, but I always called them deals,” she says. “For me, it was always the thrill of the deal.” By 1979, Halliday convinced Burleson to work with her on a corporate level. The two proved to be a powerful duo. Since Halliday’s death, Burleson has been repositioning Ebby Halliday Cos. from a legacy company to one that’s on the leading edge of incorporating technology—especially mobile platforms. 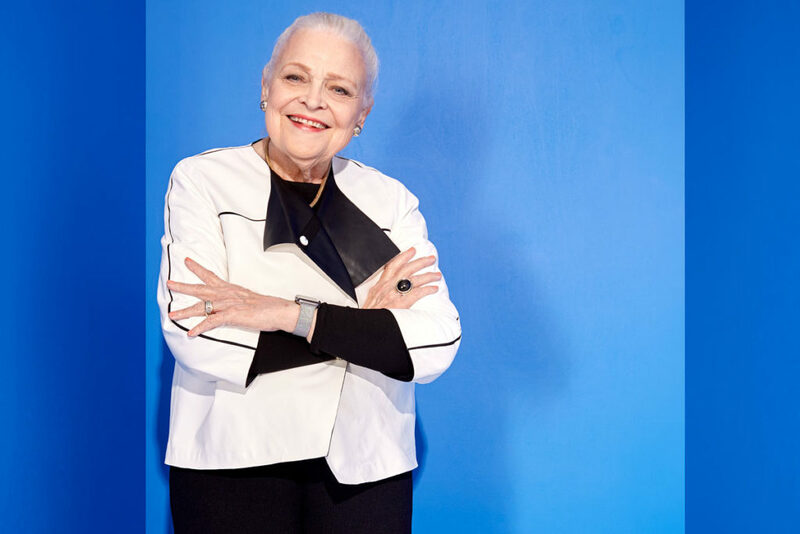 The 81-year-old says she has no intention of slowing down. “I’m not going to sit on the porch and rock,” she says. “If you do, your mind and body atrophy, and I don’t have time for that.” —C.P.